In September 2017, Cyberlink launched PowerDirector 16 with many new features for 360 video editing, including image stabilization and object tracking. 12/29/17 update: I tested the stabilization to see how well it could stabilize a 360 video and how it compares to gyro-based stabilization. Check out the results of my test below. Previous versions of PowerDirector had 360 video editing but lacked some features such as 360 titles. Now Cyberlink’s PowerDirector 16 has several powerful new features for 360 video editing that put it ahead of its competitors for 360 video editing. I tested PowerDirector 16’s stabilization with the Insta360 ONE. As a preliminary matter, I found it extremely easy to use the stabilization feature. You simply click on the video, click on the enhance menu, check the box for video stabilization. If you’re using a 360 video, it automatically applies 360 stabilization instead of the non-360 EIS. Test #2: Insta360 ONE gyro-based stabilization vs. PD16 stabilization. 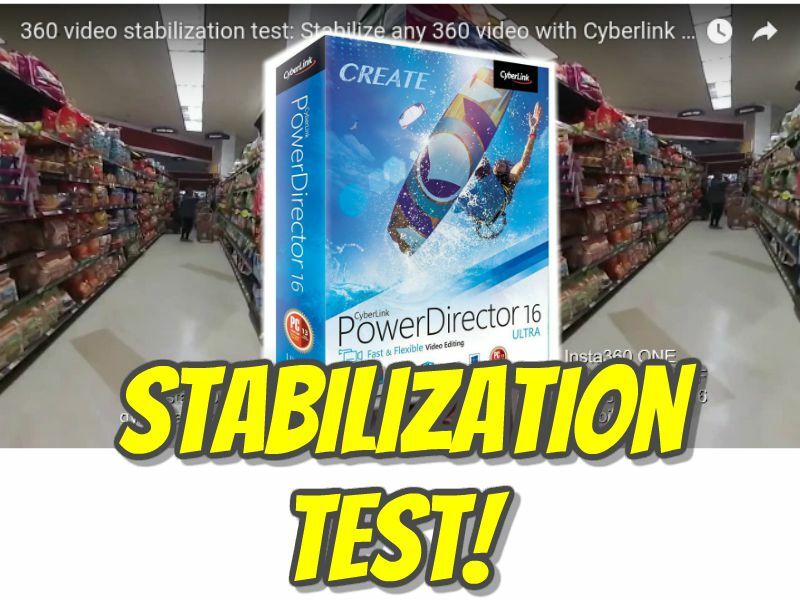 Test #1: Unstabilized video vs. PD16 stabilization: PD16’s stabilization was a huge improvement. What’s more there was no blurring in the stabilized video (whereas in some stabilized 360 cameras, such as the Insta360 Nano, the video gets blurred when stabilization is active). Test #2: Insta360 ONE gyro-based stabilization vs. PD16 stabilization: To my eyes, the PD16’s stabilization had comparable performance to the Insta360 ONE’s gyro-based stabilization. One important difference is that the ONE’s gyro-based stabilization is locked to a single compass direction. With PD16’s stabilization, the camera followed the shooter’s point of view. This could be useful for situations such as when driving (if you want the 360 video to face the direction the car is traveling), which could give reason to use PD16’s stabilization even if your camera already has gyro–based stabilization. Test #3: Insta360 ONE gyro-based stabilization vs. Both gyro-based stabilization and PD16 stabilization: In my opinion, adding PD16 stabilization to gyro-stabilized 360 video did not result in a meaningful improvement. In some parts of the video, it looked better, while in other parts, it looked worse. Based on these tests, I conclude that PowerDirector 16 Ultra’s 360 video stabilization does work very well, even if it’s not perfect, and IMHO, this feature by itself would justify getting PD16, even if you don’t use the rest of the program. 360 titles: You can now place titles anywhere in your 360 video, even on the nadir or zenith, and it won’t appear distorted. – Little planet mode: PowerDirector 16 can convert your video into a tiny planet. – View designer: create a non-360 video out of your 360 video, with full control over the perspective. – Color grading for 360 videos: besides changing color, you can also apply noise reduction (luminance and chroma noise) or sharpening. Cyberlink Powerdirector 16 is available by itself for around $50 (a discount from its $99 MSRP) or as a bundle with Photodirector 9 which has built-in 360 editing functions such as a tiny planet mode and removing tripods from the nadir. I hope you found this post helpful. FYI you can get articles automatically emailed to you by subscribing to 360 Rumors for free! It’s lame that the 360 stabilization isn’t available to try in the trial download. Simplified stabilization is pretty much the only reason I have to buy this so naturally I’d like to make sure it works on the files I need it for before I shell out money for it. So far the stabilization is good, but after exporting it’s making a bit of that nadir vortex effect, still messing around with it to see if I can eliminate that. They say on their website, 360 editing is included in the trial version. Did you test it? What really is a downside: You can’t edit in 4K with the trial. Kai, 360 editing isn’t in the trial version so I just bought it and tried it. The shake reduction works very well without having to deal with all the BS of mettle plugins and After Effects. In my opinion Powerdirector is worth buying for the shake reduction alone considering what a pain all the other methods are to deal with. YES!! Bought the update and am about to install v16. Excited about it too, Cyberlink is very close lipped when it comes to future versions. The new feature Set inital view is also very welcome and works well, BUT only if you shift horizontally. It allows you also to look up/down, but this changes orientation of the Z-axis, making the horizon spin around that: not good. I will post to the PD forum as well tonight. You can see this happening a bit in the third clip with my dog in the video. Also, the View Designer menu item is completely missing here. I posted this on the PD forum already. Randomly when I click the Set Initial View, I get a warning about switching to 2D for View Designer, but clicking it does not open View Designer but the Initial View window. I imagine the Little Planet option is in the View Designer? The video I posted was exported with 2880×1440, since that’s also the LG Cam’s resolution. I have other options for 3840×1920, 3840×2160 (? not equirectangular?) and 4096×2048. Can’t you just export at 3840×1920? I get black areas in the resulting video if I use those resolutions. Basically if the resulting video has black bars at the top and bottom when you view it in equirectangular format it’s not gonna look right in 360 view. All the resolutions in the pulldown menu appear to be relatively standard 2D resolutions which often don’t translate well when exporting 360 videos. I find that rather baffling consider they tout 360 editing features prominently for this version. Frank, do you have more than one option for codecs/formats under the produce tab? Mine only shows h.264. If you see black bars, chances are you selected 3840×2160. That is not a 360 (equirectangular 2:1) format. I think it is an error that it’s there. Try it at 3840×1920. That is 2:1 format, and should not give black bars. No, I also only have h.264 codec, but that is the same in v15. I think it’s the goto codec for 360 MP4 files? Could you tell me more bout the weird nadir/zenith swirls? Or post an example? I see somebody else in the PD forum having the same issue. The resolution you mentioned works, as well as the highest one, I can also get it to export at the native resolution by making a custom profile then editing the ini file in notepad. They all give a nadir effect that is relatively minor, strangely enough youtube seems to eliminate it after uploading. The nadir effect is small enough that it would probably only matter if you were say…wearing a hawaiian shirt while holding the camera on a monopod away from you. If the south pole of the video is a dark color or consistent in color it’s not a huge deal. Glad it works! I’m quite convinced the 3840×2160 resolution should not be there. I am truly amazed by the stabiliser. Don’t be afraid to crank it up to 60 or 70 or so. I just quickly re-did one of my latest videos with the new stabilising. I stabilised about 20 or so little clips in this 4 minute movie. If you have two monitors, open a Youtube tab on each and watch them simultaneous. The difference is stunning! Mic, did you advice another one. This one until now is out of stock! I am still waiting for affordable video editing software that enables support for exporting the PRO’s 8K video and photo’s in 360. Upon testing Powerdirector 16 shake reduction further, it still works great on Mi Sphere videos but it doesn’t seem to like Ricoh Theta S videos at all. My only guess is that the resolution is just too low for whatever method the program uses to track motion. I just thought I’d throw that out there for anyone thinking about buying it if Theta S videos are all you were thinking about using it for. could you please explain in detail how you rendered a file in native MiSphere resolution (3456x1723px) by editing something in notepad?! I was looking for some preset file to edit but couldnt find any. A short hint where to look again would be much appreciated and a great help for my first experiments with the new software. Thx for compare. Looks good. But what about stabilization compare ex-Skybox vs PowerDirector16 vs… Autopano?